The following article comes courtesy of /u/Fizz11 from reddit. 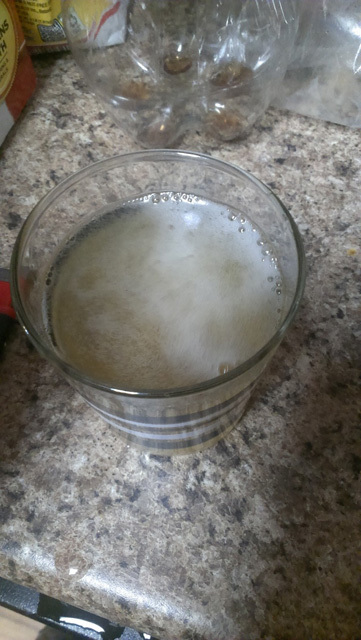 Sweet carbonated cider is easy to make... if you have a keg setup. Sadly, not all of us have one available (myself included). Fortunately, there is a way to get sweet carbonated cider through natural bottle carbonation. So, what makes that so hard to do? When you back sweeten a cider, it introduces far more sugar than is needed for carbonation. Left to their own devices, these delicious drinks would soon transform into dangerous bottle bombs. Without special steps, you must either allow your cider to ferment fully, then prime and bottle condition - which yields a carbonated (but very dry) cider - or you must kill off the yeast when you sweeten, which yields a still cider. Which leaves us back at square one. How then, is it possible to have a sweet, bottle carbonated cider? Here are the steps you can take to accomplish that. Step 0: Make sure the sugar used for back sweetening is thoroughly mixed at bottling time. If using a solid sugar (and not, say, apple juice), you'll boil your sugar in a cup or two of water, then add it and give a gentle stir to ensure full mixing. The safety of this entire process is reliant on the idea that all bottles carbonate at mostly the same pace... which requires an even distribution of your sugar. 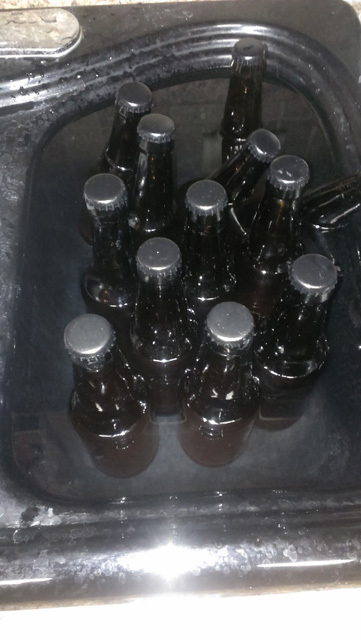 Step 1: At bottling time, I fill one plastic water bottle with my cider to keep an eye on how the carbonation is going. After three days in my case (time can vary), the bottom of the bottle was starting to expand out, and it all felt really tight. I opened it and poured, and discovered the perfect amount of carbonation. If you open early and it's still flat, wait another twelve to twenty-four hours, then pop open another bottle to check. Carbonation level check looks good! 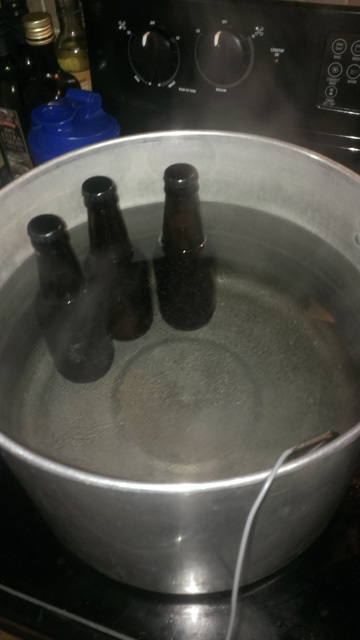 Step 2: Preheat the bottles. We are going to be putting already pressurized bottles into 180 degree F water. 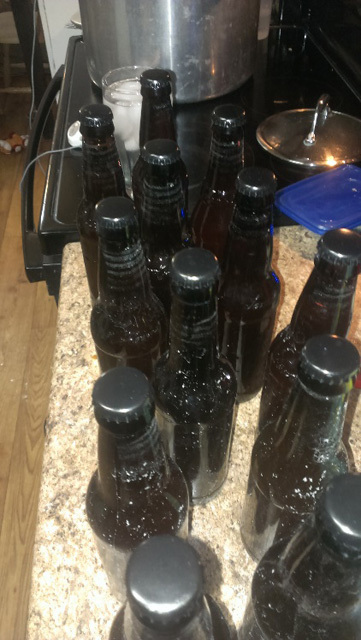 Preheating helps avoid any thermal shock the bottles may experience, and will help avoid bottle explosions. This process is as simple as filling your sink with hot tap water, then placing your bottles inside for a few minutes. Most people's tap water comes out around 120 degrees F, which is a perfect stepping stone for our bottles on their way to 165 degrees F.
Step 3: Pastuerize the bottles. Pasteurization is simply bringing the temperature of the bottles to around 165F for a short time. At that temperature, ten seconds is all the time needed to ensure that no yeast are left alive - which means that no more sugar will be converted to CO2, thus locking in your carbonation level. 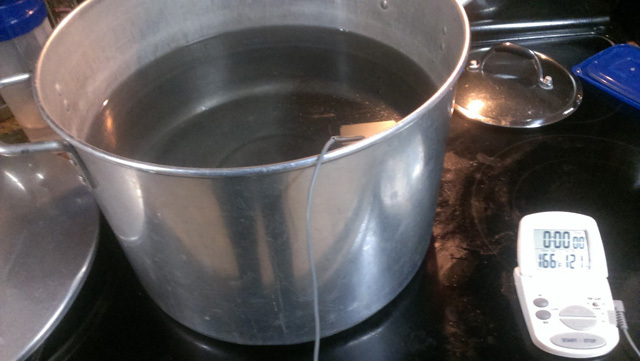 The best way to do this is to bring a pot of water up to 180 degrees F. If you are on an electric stove, wait a few more minutes for the temperature to even out, then submerge the bottles for 10 minutes. You may want to first put a hand towel or wash cloth in the bottom of your kettle to insulate against the electric element and give the bottles a softer surface to sit on while they rest. After about 10 minutes into the process, the internal temperature of the bottles should be at least 160 - 165 degrees F, which is well more than enough to kill off the yeast. Beware! This step is the most dangerous part of the process. If you have weak bottles - or if any bottles are already overcarbonated - you risk having bottles explode. Safety is always important! I suggest wearing a thick jacket with safety glasses during this step, just in case. That said, making sure that all the sugar is mixed, inspecting your bottles beforehand, and keeping a close eye on the carbonation level as time progresses will drastically reduce the risk. I've done over sixty bottles at this point, and have had exactly zero explosions. After ten minutes I pull the bottles out to let them cool, then start warming the water back up to temp for the next batch. Finish up all your bottles, and you're done! Now you can enjoy your sweet carbonated cider without worrying about exploding bottles. The recipe I used for this batch is embarrassingly simple. Ferment 1.5 gallons of apple juice with half a pack of S-05 yeast and 1 tsp of yeast nutrient. At bottling time, add 1 gallon of apple juice and 80g of table sugar. A couple of weeks ago, /u/Fizz11 made a fantastic post to imgur, sharing with us his bottle pasteurization method for cider. It was extremely well received by the community, and seemed a shame to be lost to the bowels of reddit. So, I reached out to him to see if he would be interested in posting this great content to Homebrew Dad. He was, and here we are. publish it on your online . You do not mind ? Any thoughts on how to adapt this process for PET bottles? I'd love to brew a cider, but coming up with a sufficient quantity of glass in Canada is expensive (last time I looked, a case of 12 oz. longnecks was $52 before shipping).